Why we need business plan ? Have you ever developed any business plan for your blog? Why a blog need a business plan? These are , please read on as I will provide the answer in details. It said by many people that over 85% of blogs are being run without any business plan and there is no surprise,if your blog is also one of them. We all know to make anything successfully we always need a business plan. 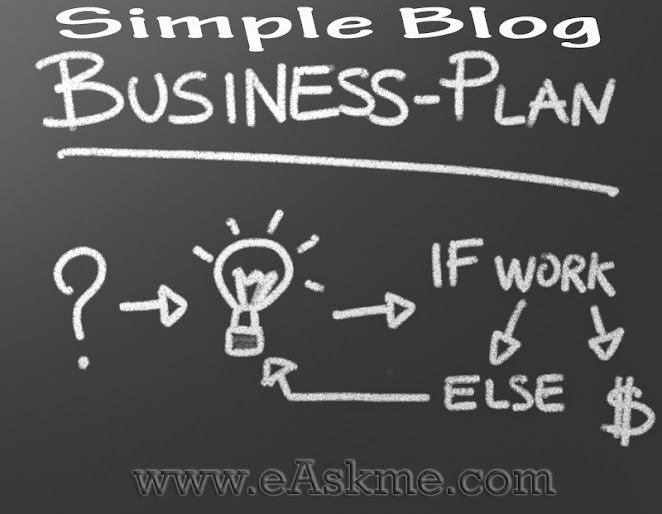 So when business plan is always good, then why don`t you use that for your own blog. It is not mandatory, but I recommend you to do it. So first see why we need a business plan for a blog. To make a blog successful, focus is a most important thing. Your business plan help you to maintain focus. There are blogger, who start their blog and after some time lose focus on their primary goals. A business plan help you maintain focus. Keep reviving your business plan regularly. A good business plan help you in developing a long or short term strategies for your blog. You should start panning today for your blog. Investors only invest where they find a profitable business plan. So when your blog grow in popularity, many investors can contact but, but to give you contract they need a good business plan and financial records of your blog. So always keep your business plan and financial records ready. Remember you can`t get interest of investors till you don`t have a good business plan. In executive summary you introduce your blog. It must include the idea behind the creation of your blog, blog objectives and overall strategy. This should be clear to give overview of your business plan. This section of business plan is, you and your partners make it clear that how and why you launched this blog. Here You should explain niche analysis, targeted audience, research result, and business ideas . In this section you will explain the objectives of your blog, goals, vision and mission. You should also write growth strategy of your bog. In biography section you will define your team and purposes. Are you a co-founder or sole founder. This show the ownership status of the blog. You should mention names of your team, responsibilities, their strengths and weaknesses, area of expertise and prior achievements, . In this section you talk about how you make money from your blog and what are your monetization plans? Like you want to monetize blog with advertisements,, product sales or services or affiliate programs?. Here you will explain your research and basis of your blog. Why did you target the your current blog niche? Is the niche broad or narrow? What is the global and local search volume of your ranking niche keywords? How much traffic you get from search engines? How you niche is growing or dying? You should answer these questions. How do you spread words about your blog? How will you attract targeted audience? How much are you want spend to promote your blog? What are your advertisement methods? Which marketing strategy will bring more fruitful result for your blog? Is it joint ventures, free campaigns or paid campaigns, search optimization? What marketing tools you should use? Who are the major competitors in same niche? How do your competitors attract traffic to their blogs? How did your competitors monetize their blog? What is their control over the niche? You should explain these questions in your blog marketing plan section of your business plan. In this section you show financial forecasts and the methods you use to get your target. Show expected earning. Analyze earning of your competitors and it will give you good idea to project your earning. Everyone want their blog to be success and noone want to talk about exit. But there will be a time where every biggest company go in doom. So always plan for that in advance? Your exit strategy shows your financial intelligence. Business plan of your blog always work as a guide throughout the time of your own blogging era. We all know that every business has some ideas. Do share if you have your own business plan or you are running without it. If you have any question, feel free to ask me in comments. If you like this article, don`t forget to share with your friends and family. Subscribe our RSS feed to stay updated. Happy Blogging!